Lisa Leienberger and her Buckeye Valley teammates opened the postseason in style Tuesday, rolling past visiting Horizon Science in the first round of the Division II District Tournament. Leienberger finished with eight points in the Barons’ 72-7 win. 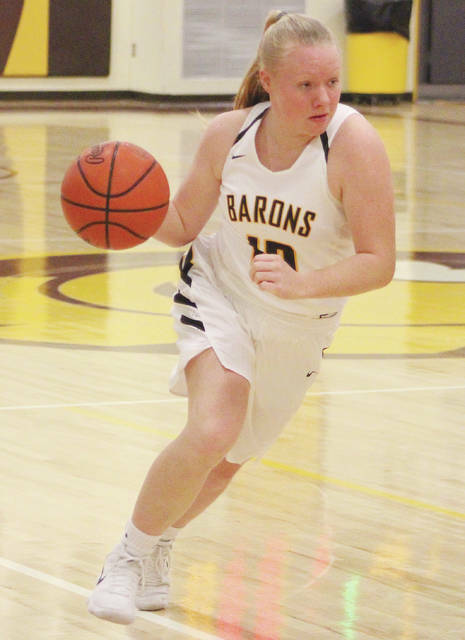 The sixth-seeded Buckeye Valley girls basketball team opened the Division II District Tournament with a statement win, cruising to a 72-7 first-round romp over 17th-seeded Horizon Science Tuesday in Delaware. The Barons weren’t messing around. They led 26-2 after the first quarter and 46-5 at halftime. A 23-0 third quarter ballooned the lead even more before BV called it a night. Nine different Barons scored by the time the dust settled. Morgan Scowden led all scorers with 18 points while Dani Grether finished with 14 in the win. Cami Crawford was also solid, adding nine points, while Lisa Leienberger and Hannah Cowan had eight apiece. Next up, Buckeye Valley turns its attention to 10th-seeded Beechcroft. The Barons will host the Cougars Friday at 7 p.m.
“They’re one of the more athletic teams we will have faced this season,” Stout said. “We’ve seen them play a little bit of both man and zone … and we’ll have to make sure we’re ready for their quickness and overall effort. They will be ready to play. The Braves are peaking … just in time for the tournament. Olentangy, thanks in part to a 21-14 fourth-quarter push, pulled away for a 76-64 Senior Night win over visiting Marysville Tuesday in Lewis Center. Sean Marks led all scorers with 29 points while senior Jerred Kinnaird poured in 18 in the final home game of his career. The duo combined for eight of the team’s 11 three-pointers. It was the Braves’ fifth straight victory to end the regular season. The 19th-seeded Braves, who finished the regular season 10-2 against non-league opponents, open the Division I District Tournament against host Darby, the No. 18 seed, Saturday night in Hilliard. Tip is set for 7 p.m.